Diana Gabaldon has written interesting essays, included as forewords and introductions, for special reissued editions of non-fiction books about history and classic novels. An introduction for Modern Library’s paperback edition of the classic IVANHOE, by Sir Walter Scott. This edition was released in 2001. An introduction to the Bantam Classic printing of COMMON SENSE by Thomas Paine. This edition was first released in 2004. 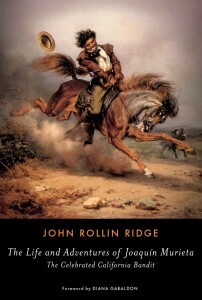 In 2018, Diana wrote a new foreword to THE LIFE AND ADVENTURES OF JOAQUIN MURIETA: THE CELEBRATED CALIFORNIA BANDIT, written by John Rollin Ridge (also known as Yellow Bird). Zorro and Batman were inspired by the hero of this novel, first published in the mid-1800s. All of Diana Gabaldon’s books are available from the usual online sources, as well as your local independent bookstore and other stores. For readers who wish to obtain a new book signed by Diana, she has a special arrangement with The Poisoned Pen bookstore in Scottsdale, Arizona. The Pen ships anywhere in the world. You only pay for the list price of the book and postage. Click here for more information about The Poisoned Pen bookstore. This page may not include all forewords and introductions that Diana has written. Research is being done by Diana’s Webmistress to eventually include all of them. This page was last updated by Diana’s Webmistress on Tuesday, July 24, 2018, at 2:10 a.m. (Pacific Time).